Get Your Name Seen Across Scotland! 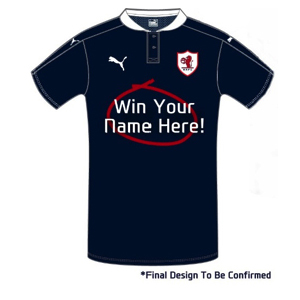 Raith Rovers Football Club is offering a fantastic affordable opportunity for YOU to have your company or individual name seen across Scotland next season. The club are looking for front and back of shirt sponsorship on a brand new eye catching away kit for next season. Breaking away from the norm, the club is offering national and local businesses, groups, charities or even individuals the chance to enter a sponsorship draw at a cost of only £350 per entry. The first prize will be your logo ⁄ name on the front of the new away kit for next season. The second prize will be your logo ⁄ name on the back of the new away kit for next season. First prize winners will also have their name ⁄ logo on all replica tops. Tickets go on sale from 26th November until 8th January and can be purchased from Stark’s Park, or by emailing commercial@raithrovers.net. Each entrant will receive acknowledgement in the match day programme. The prize draw will take place at a Sponsorship Reception evening in the Raith Suite at Stark’s Park on Monday 11th January, where Ray McKinnon will make the draw. Raith Rovers reserve the right to invalidate entries which may be likely to cause offence – ie – acronyms which may contain subliminal messages.